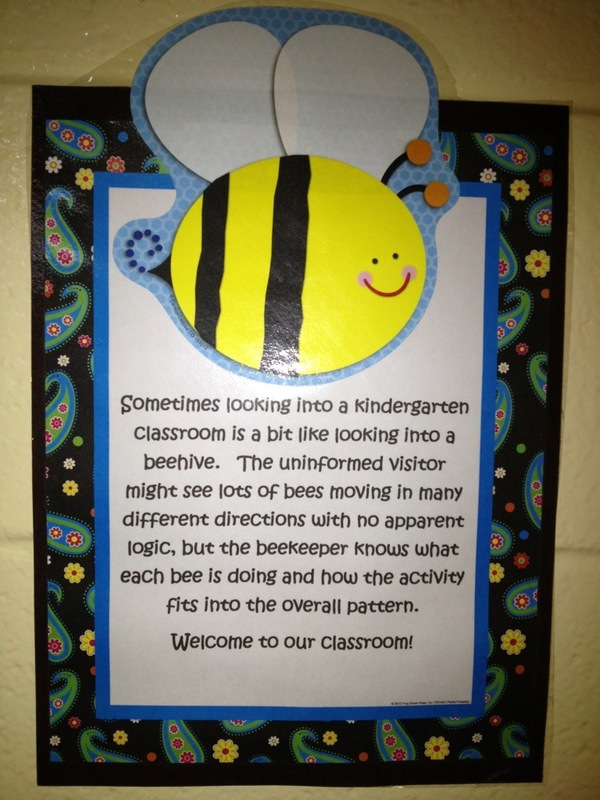 Welcome to the happiest place on Earth….Kindergarten! 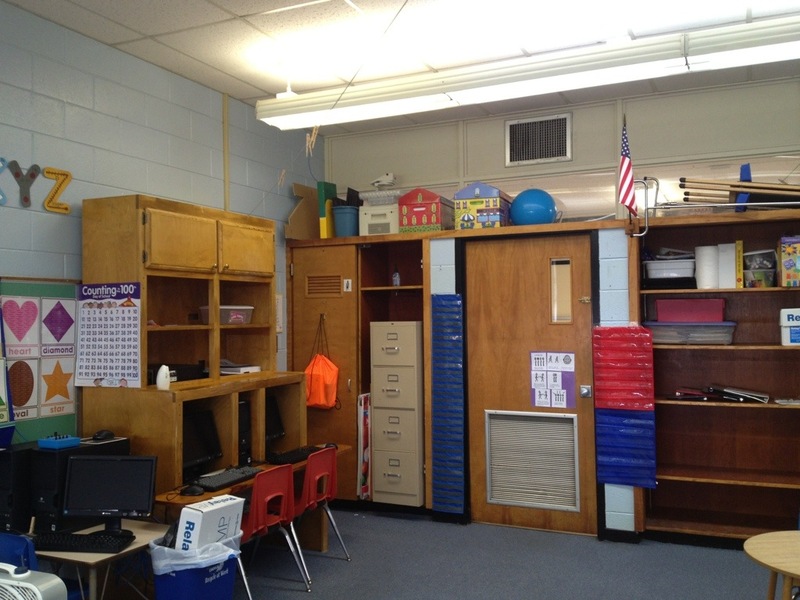 This is just a simple virtual tour of my mostly, but not all the way, completed classroom. If it makes you feel all warm and cuddly inside-that’s great! 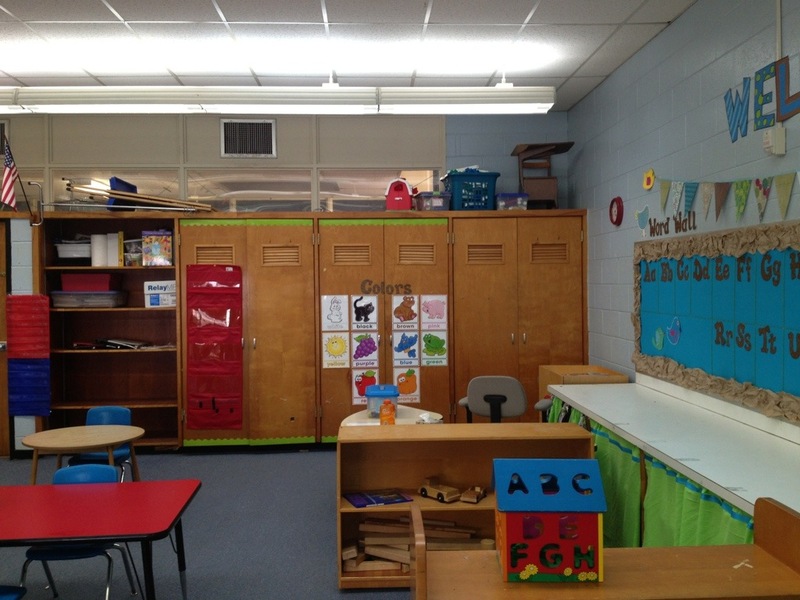 My Kindergarten classroom is not the typical 18-24 student classroom. I have the privilege of having 8 wonderful students, who just happen to have special needs and other obstacles. But you know what? These children are little geniuses in the making. 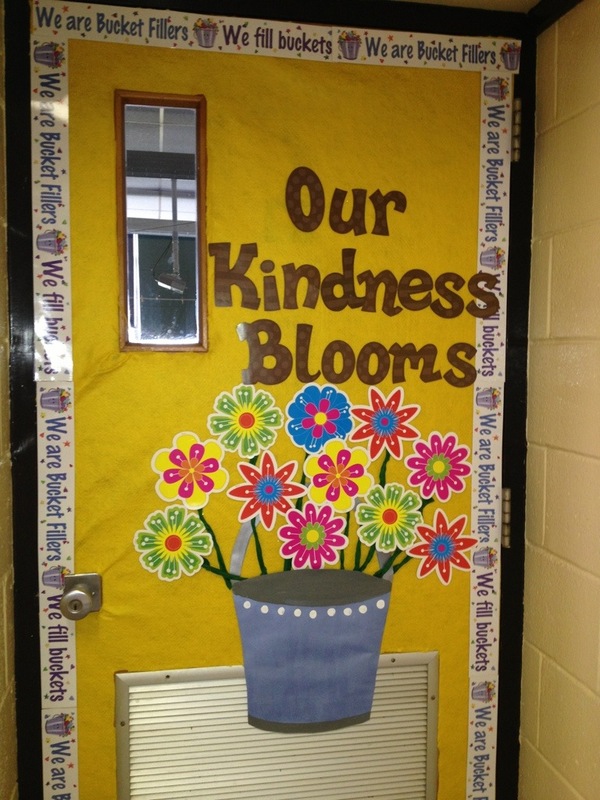 I am so looking forward to this school year! I will post more later….but here we go…on with the tour! 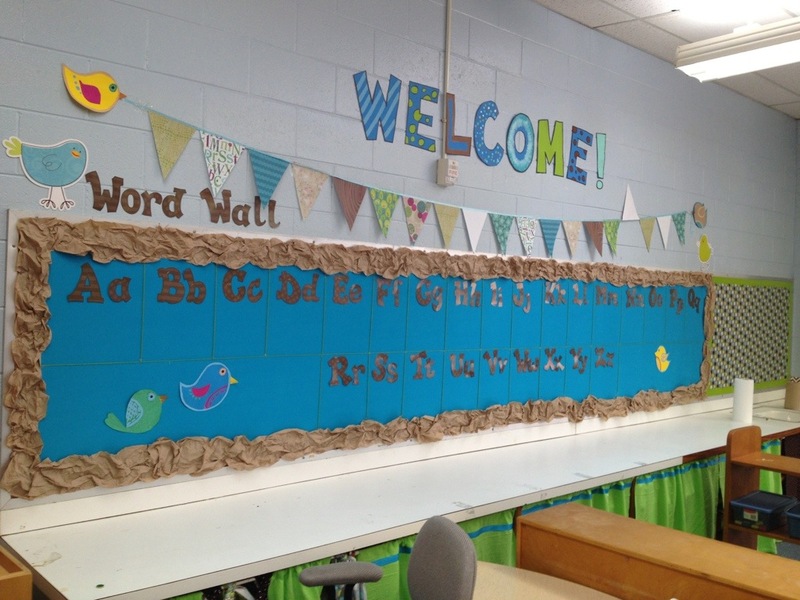 In these pictures, is my Word Wall for sight words, Possible Birthday Board, Home-ade un-stiched mini-curtains and more! The blue material is from Wal-Mart. The border is made out of brown paper towel rolls just all scrunched up and stapled on. My pennant banner was made from scrapbook paper from Wal-Mart and then stapled onto thin ribbon (also from Wal-Mart). 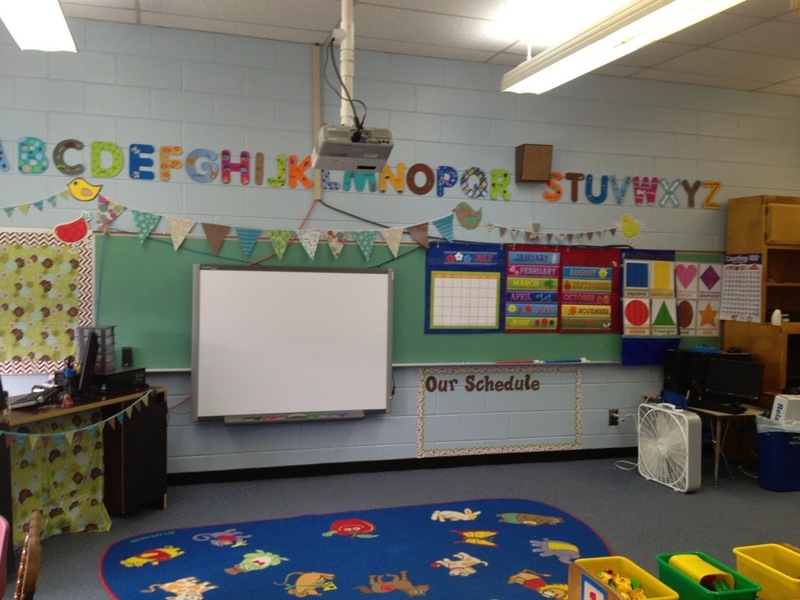 The WELCOME sign above the bulletin board was hand-painted by me. I’m so proud of it because I am not exactly an artist. I just hand wrote out the letters on blue poster board and then used acrylic paint to decorate each one. I made my swirly tree by ripping up brown grocery bags and twisting them at the ends. I’m not sure what I am going to put on the tree yet. 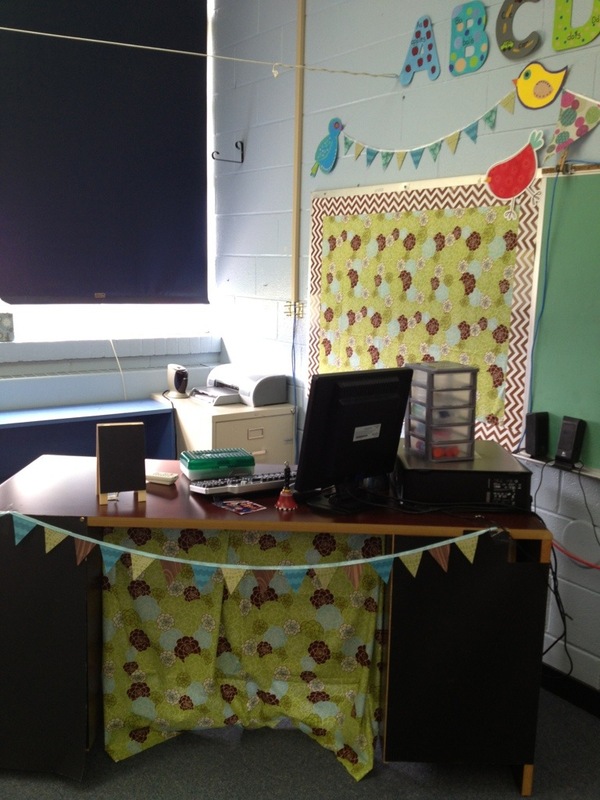 Hmmmm… I still haven’t decided what to do with the polka-dotted smaller bulletin board either. I may put my birthday wall there. We’ll see! These cute lime green curtains were so cheaply made. I bought those springy type curtain rods and material from Wal-Mart. Then, I stapled the material around the rod. To cover the staples, I used blue ribbon (from Hobby Lobby) and no-stich glue, because I don’t sew. 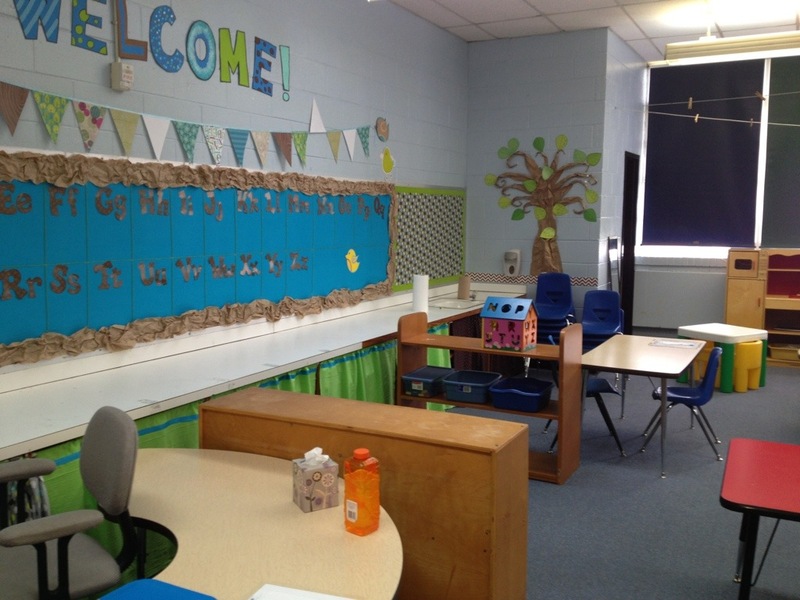 In this picture you will also see the Block Center and to the left of it, a table for 1:1 work with students. 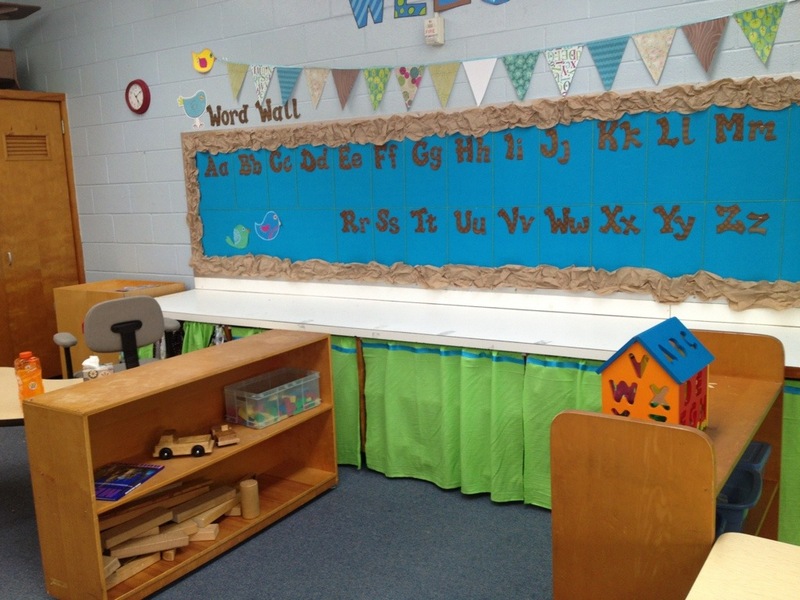 The brown ABC Word Wall letters were made by Frog Street Press. 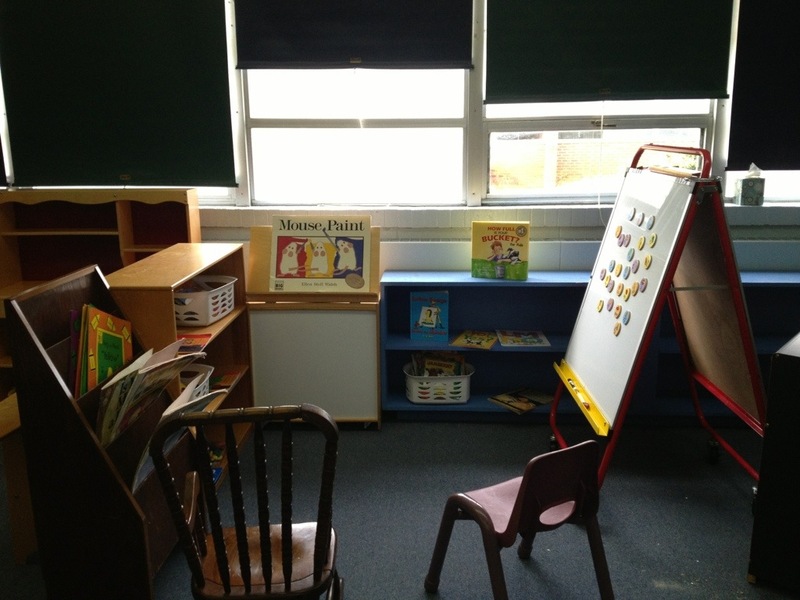 This is my Reading Center. It’s still in the making. Here is my fun desk! The funky flower material is from Hobby Lobby. 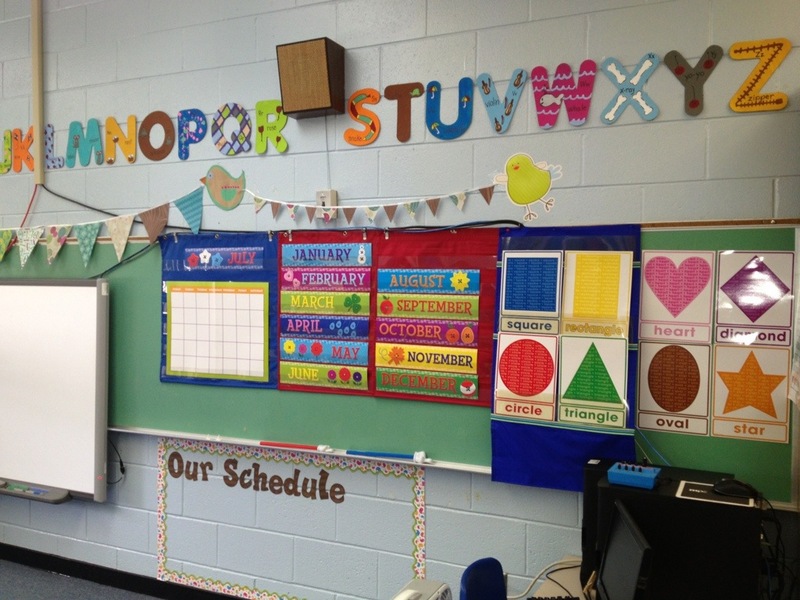 I actually hand-painted these capital letters above the Smart Board. The letters are from Lakeshore Learning. It was a fun project. That’s what I did this summer! The calendar, months of the year and shape signs are all from the Dollar Tree. Aren’t they cute?! This cute fabric is from Hobby Lobby. I simply taped the material under by desk (you know, since I don’t sew). 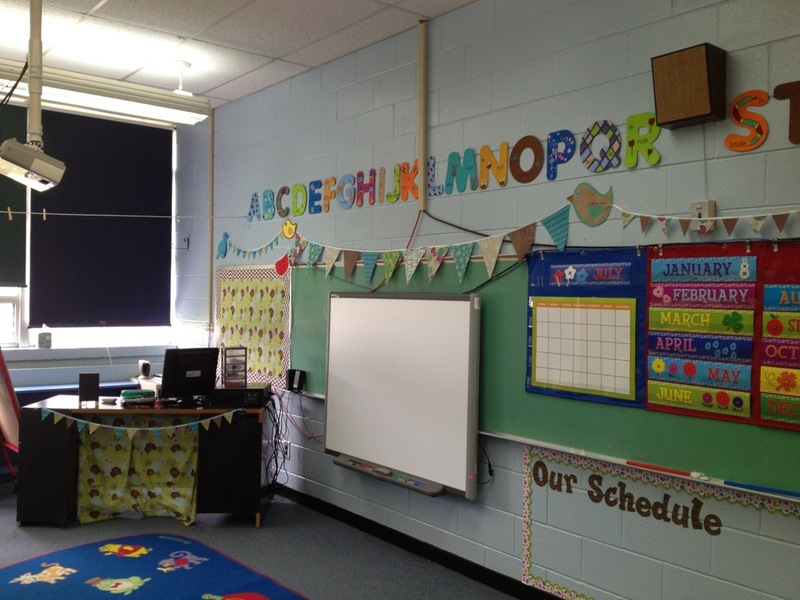 The “Our Schedule” section is at eye-level for the children and I will be putting Board Maker pictures of the schedule there -once I make them! Our School, Thompkins Early Childhood Center in Ozark, Alabama, is a “Bucket Filling School.” I will write more about bucket filling later. It’s great-but I will stay on topic for now. This is the most precious little sign that I have outside of my classroom door. All of the classrooms have this sign. I think it’s a great reminder for everyone who enter! I hope you enjoyed this mini-tour!